Regular readers of my blog will know I am very fussy when it comes to perfumes - so I was over the moon when I found a new one which I actually I like love. Midnight Rain by La Prairie is my newfound love, and I've been reaching for it every day. The set I have includes a 50ml bottle of the eau de perfum, and a 100ml tube of body lotion (or Body Veil, as they like to call it). 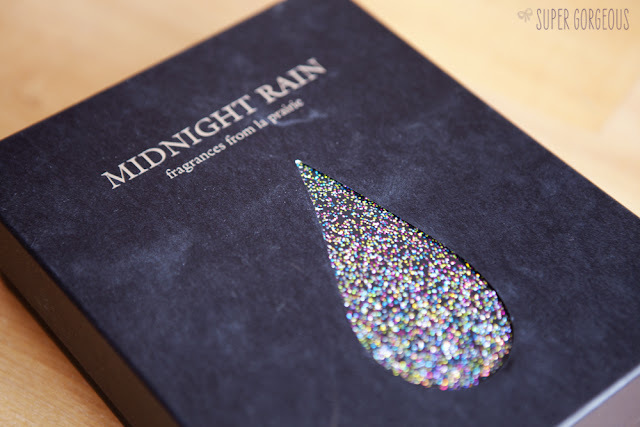 The packaging is a really clever play on the title; with the black casing, and perfume shaped like a rain drop. 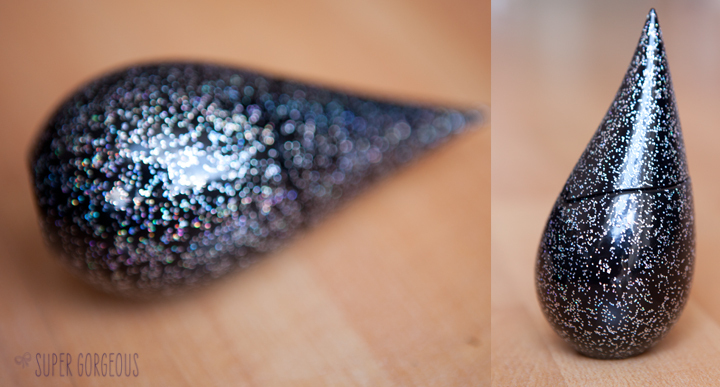 The black bottle is covered in silver flecks which show up as rainbow sparkles when the light hits them. It was really hard to capture this in a photograph, so I took one out of focus to try to get the vision across. I initially found the bottle really hard to open, my hands kept slipping off the pointed lid, but I've since discovered twisting it off works a treat. My only other gripe is the price. This is an expensive perfume - very much worth the money, but unfortunately not something I'd be able to afford on a constant rotation, as much as I like the idea. Cheap perfumes often have a distinct smell to them - the same can be said for this but the other way round. It has none of the trademark cheap whiffs to it, instead smelling full-bodied, luxurious, and is long lasting on the skin. It is described as a 'fruity floral' perfume, but I don't get much of a floral vibe from it myself. To me it's musky, with hints of vanilla, a subtle fruity sweetness and woodyness. I find that the smell seems to change as well, from when you first put it on to ones it dries down and sinks into the skin. I can't really notice it on myself after a while, which I believe is a sign of a good match of a perfume. The top notes are actually exotic fruit and freesia. Middle notes of textural white florals, white lilty, exotic fruity florals, vanilla orchid, plum flower and amber flower, with Base notes of feathery musks, enigmatic patchouli, earthy vetyver and smooth cashmere woods. For nights out, I've been using the Midnight Rain Body Veil after showering to layer up the scent for a bit more of a kick. As I would expect, it smells just the same as the perfume - both good enough to eat! La Prairie is one of the last places I would have thought to have looked for a perfume, but I'm so pleased with my new discovery. Next time you're passing a counter, please have a sniff for me! La Prairie Midnight Rain is available from Harrods.